How did this unusual mix of scholars and lay people come together to write this book? In the summer of 2005, a relatively small group of individuals met in Redlands, California. Message board discussions, e-mail exchanges, and phone calls brought them together because of a growing passion to discuss one central question: “What kind of a Person is God?” The conversations took place in the basement of the local library and attracted no attention. For those who were present, however, the end result was a palpable admiration for God’s goodness and love. Out of this small meeting, the Good News Tour conferences were born—a total of seven conventions from 2006-2009 that included a diverse collection of theologians, pastors, builders, teachers, computer programmers, physicians, and others who met together to share publically their perspective on God’s character. The idea for Servant God originated out of these meetings and is intended for anyone who desires to explore God’s character in greater depth. Our experience has been that the subject of God’s character can lead to a cascade of difficult and sometimes troubling questions. Merely affirming that “God is love” (1 John 4:9) does not satisfy a mother who lost her young daughter to leukemia. This mother wants to know why the all-powerful God allows such pain and suffering. Did God will the death of her child, or is he too weak or uninterested to help? How can he have an enemy (Satan) who challenges him? Are we really safe in his hands? Why do some of the Old Testament stories seem to make God appear severe and punishing? How do we reconcile gentle Jesus with the frequently violent portrait of Yahweh? Even the New Testament can present some challenges: Did the Father kill his Son on the Cross? Why did Jesus have to die, and who demanded the sacrifice? Do we have free will to choose for or against God? And what about hell? Does God really torture his enemies for all of eternity, or at least for “as long as they deserve,” in order to satisfy justice? Many are haunted by such questions and consequently experience separation, alienation, and distrust in God. Yet each of these concerns can be traced back to a single core question: What kind of a Person is God? Servant God does not promise to delve into detailed discussions or exhaustive theological discourses on each of the above-mentioned topics. Nor does it guarantee to present a comprehensive summary on the various views of the atonement, the nature of Christ, or the mechanics of salvation. Our goal in this book is to plainly discuss difficult questions about God that we all have, using words that everyone can understand. Most importantly, every topic is examined in its larger context—the universal war between God and his adversary (also called the devil, or Satan). The outcome of this cosmic conflict will forever resolve the fundamental question of God’s character and trustworthiness. 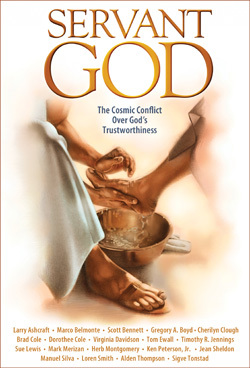 The authors’ unanimous conclusion is that God can be trusted and that his character is most clearly revealed in the self-sacrificial life and death of Jesus Christ. The various authors were chosen, either because they were speakers at one of the Good News Tour conferences, or because they were part of a larger base of individuals who have a particular insight or passion for the message presented. Each writer examines a different subject of the Christian faith as it relates to our central question about God’s trustworthiness—be it the nature of sin, suffering, human freedom, the law, justice, judgment, or the atonement. Servant God is unique in its inclusion of a wide variety of contributors, both theologians and lay people. In fact, we believe that this blend of writers is symbolic of those who will comprise God’s kingdom—people from different backgrounds and walks of life joining together because of a common message, and mostly because of their love for a Person—God revealed in Jesus. Part One, “The Old, Old Testament,” examines the origins of the “War in Heaven” (Revelation 12:7). Why does an all-powerful God allow for an enemy and even confer on him the title, “the prince of this world” (John 12:31, 14:30, 16:11)? What are the issues in this cosmic conflict, and how does this perspective help us explain the existence of sin and suffering in this world? Part Two, “The Old Testament,” compares and contrasts the self-sacrificial, non-violent, “love-your-enemy” picture of God revealed by Jesus Christ, with the Old Testament Yahweh, who frequently thunders loudly, sends fire and floods to destroy, and even seems to command the genocide of Israel’s enemies. Can we reconcile the God of Sinai with the God of Calvary? Part Three, “The New Testament,” takes the perspective that the birth, life, death, and resurrection of Jesus are the clearest, 20/20-vision look at God’s character. In Jesus, we see a God who is the very personification of love and forgiveness. Part Four, “The Now Testament,” applies our new understanding of God to the events we associate with the end of time, such as the Second Coming, the judgment, and the question about hell. Part Five, “The Living Testaments,” attempts to apply our understanding of God to practical, daily life. What difference does this view of God make in the way we live, treat our neighbors, and communicate with God? Our hope is that “by beholding we become changed” (2 Corinthians 3:18), and that the realization of the unfathomable kindness of God is the first step in our healing and the restoration of our world. Finally, we want to acknowledge the historical stream of thought that influenced many of the writers. For decades, Loma Linda University has had a special emphasis on the ongoing controversy over God’s character. Roughly a hundred years ago, the pioneer and founder of Loma Linda University, Ellen G. White, published the five-volume “Conflict of the Ages” series with this same focus. Throughout the twentieth century, this emphasis continued at Loma Linda. Pastors such as Paul Heubach, theologians such as A. Graham Maxwell and Jack Provonsha, as well as many others, continued to develop further this perspective. We would like to acknowledge this rich tradition and find it most fitting and appropriate that the publisher of this manuscript is Loma Linda University Press. Servant God seeks to touch on this rich heritage, not claiming always to reach the same conclusions or even the full depth of understanding that prior giants have had but to keep the conversation about God, his character of service, and our own role in the cosmic conflict alive.